MISAKO & ROSEN is pleased to announce our fourth exhibition with Miki Mochizuka - Quadrangle. Miki Mochizuka was born (1974) and presently lives and works in Shizuoka, Japan. Mozhizuka's recent solo exhibitions include Sunday, The Vangi Sculpture Garden Museum, Shizuoka(2012-13) and SLS, MISAKO & ROSEN (2010). In 2010, Mochizuka participated as an artist in residence in Bremen as part of DECWAS (150 Years of Japan/Germany Exchange). in 2013, Mochizuka collaborated with plant artist Qusamura on an installation for the exhibition space Sunday, Tokyo. 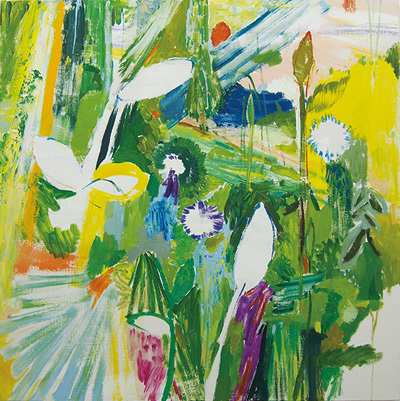 The paintings on view in Quadrangle, are representative of a shift in Mochizuka's practice; where his past works were essentially composites, imaginatively pieced together from reminiscence of particular landscapes both real and fantastical, Mochizuka's newest paintings are the result a his attempt to move away from such direct representation. The layering of paint no longer serves a metaphorical purpose for Mochizuka as his interest has shifted towards a play with the material of painting as a means to generate imagery which is more abstractly, more generally related to landscape. Amorphous, the exhibited paintings are concerned with the consequences of painting polysemy. Exhibited sculptures introduce the additional element of found object; though complete, the works in bronze and wood are playful in a manner which avoids direct representation.